It’s pretty standard for idol singers in Japan to have contracts prohibiting them from dating or otherwise engaging in romantic relationships. Ostensibly this is to keep them focused on improving their musical and dancing performances, out of respect to their devoted fans, but you could also make a pretty convincing argument that the real reason is so said fans can more easily fantasize that maybe, just maybe, the idol is saving herself for a guy like them. Either way, though, if you’re an idol, you’re not dating, and that even goes for the highest idol power in the land, Akihabara-based AKB48. 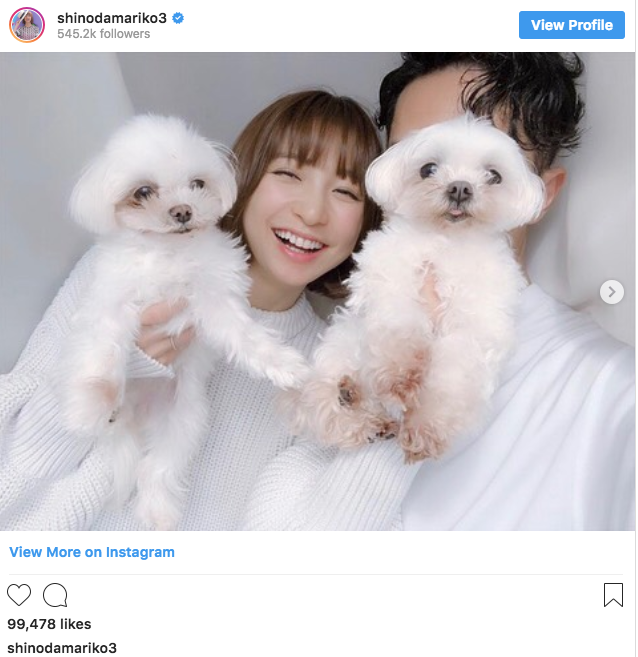 However, when Mariko Shinoda, one of the group’s original Kami 7 (the seven highest-ranking idols in its periodic popularity polls) “graduated” from AKB48 in 2013, her seven-year stint in the no-dating zone also came to an end. Since Shinoda was 19 years old when she joined the group, leaving AKB48 provided her with her first opportunity to date as an adult, and perhaps she spent the next few years leisurely enjoying the single life of a highly eligible bachelorette. However, this week the now 32-year-old Shinoda announced that she’s tied the knot, and she did so with blazing speed. ▼ Shinoda and her dog-obscured husband, who’s the owner of a beauty salon and other business ventures. In a handwritten note posted as an image on her fan club members-only website on Feb 20, Shinoda revealed that she’d gotten married the previous Saturday. She describes her husband as an “ordinary man,” a term commonly used in Japanese show business to describe someone who’s not in the entertainment industry or otherwise in the public eye, and also as three years younger than she is. The biggest surprise, though, is how short the courtship was, as her now-husband proposed to her on their first date. Shinoda and her husband met for the first time at a dinner with mutual friends last October, and had a second opportunity to see each other when common acquaintances held another gathering. Then in mid-November the pair went out to eat just with each other for the very first time, and before the date was over, he popped the question, and Shinoda said yes. It’s not uncommon for female entertainers in Japan to step away from their careers after getting married, but Shinoda, who’s become a mainstream actress and media personality since leaving AKB48, says she intends to continue working in the field as a married woman. Never heard of her, but congrats anyways. A tad frivolous and urgent, Mariko Shinoda. let hope that matrimony has presented a loving, caring husband and not a veritable Norman Bates. Well, congrats are in order I suppose. The 'dog-obscured husband' seems like a good match, judging from the photo. I got married within a time period that would cause people to make comments such as they are here. I’ve been married over 20 years now, we’re as tight as we’ve ever been. I can see it from the guy's perspective, she's famous, beautiful, and rich. Why not just go for broke and ask for marriage right away? When you have dogs, you don't leave socks and underwear on the floor. Not if you want to continue having socks and underwear. Beautiful eyes. Happy for them. She's famous outside of AKB48, she's pretty, successful on her own and has lots of moolah. I hope for her sake she didn't marry a gold digger. Men can be that way too. On the same token, Melissa Ethridge's first wife also was a gold digger. Proposing on a first date sounds too Hallmark Channel (at best) to me. And he's her first boyfriend too. I hope I'm wrong on all this but I also hope for the best. Anything is possible but nothing is real. They may have met for the first time in November, but I suspect they could be texting each other for a while as part of the friends group.